An international expert on slavery and emancipation during the 18th and 19th centuries was awarded the prestigious Earl Sutherland Prize for Achievement in Research during Vanderbilt University’s Fall Faculty Assembly. Jane Landers, who holds the Gertrude Conaway Vanderbilt Chair in History, received $5,000 and an engraved pewter cup. Her name has been added to a silver bowl she will keep for one year. 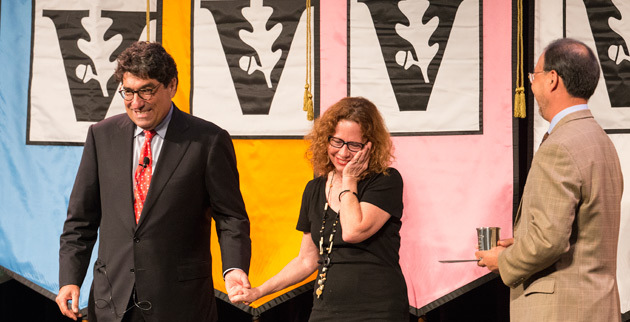 “It fills me with great pride to recognize Jane’s valuable contributions to Vanderbilt students, her commitment to collaborative projects in the humanities, and her ability to garner significant grants that fund her extraordinary research,” said Chancellor Nicholas S. Zeppos Aug. 21 at the Student Life Center. Also awarded at the assembly was the Thomas Jefferson Award and five Chancellor’s Awards for Research. 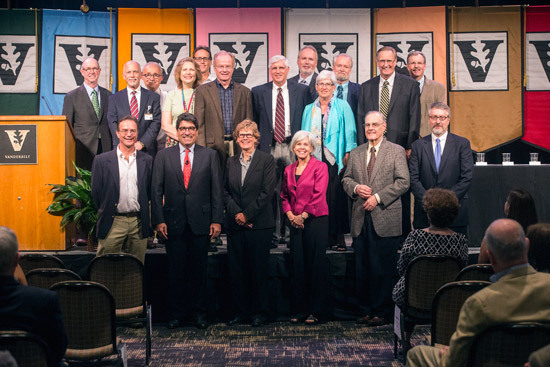 In addition, members of the faculty with 25 years of service to Vanderbilt were recognized. 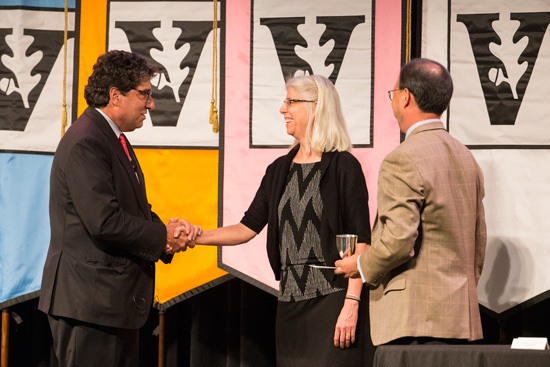 Cathy Fuchs, professor of psychiatry and pediatrics, was given the Thomas Jefferson Award for distinguished service to Vanderbilt. “Cathy is a true servant-leader who cares deeply about this university and its people,” Zeppos said. “Strengthening and bettering Vanderbilt with her unique signature of compassion and consensus building, she has served on the Faculty Senate, including a term as chair, and numerous other committees and task forces. The Thomas Jefferson Award comes with an engraved pewter goblet and $2,500. Chancellor’s Awards for Research were presented to Seth Bordenstein, Josh Denny, Isabel Gauthier, Joel Harrington and Holly McCammon. Each receives $1,000 and an engraved pewter julep cup. Bordenstein, associate professor of biological sciences, was noted for an article in Science magazine written with graduate student R.M. Brucker that demonstrates the differences of the gut microbiome between closely related species of animals reared on the same diet. Denny, associate professor of biomedical informatics and medicine, won for an article in Nature Biotechnology describing the first broad-scale validation and implementation of a phenome-wide association study. Gauthier, holder of the David K. Wilson Chair and professor of psychology, was recognized for a paper in Proceedings of the National Academy of Sciences that makes a major contribution to the field of visual cognitive neuroscience. Harrington, Centennial Professor of History, was noted for his book The Faithful Executioner: Life and Death, Honor and Shame in the Turbulent Sixteenth Century. Also receiving the Chancellor’s Award for Research was sociology professor McCammon for her book The U.S. Women’s Jury Movement and Strategic Adaptation, which traces the events leading to women winning the right to sit on juries in 15 states.